These past several months, Alicia Brzyska and I have been organizing what is going to be an amazing musical event and a charity gala in the center of Manhattan. The event will serve as a platform to introduce an international audience to a beautiful piece of music, composed by Prince Joseph Poniatowski, a relative to the last King of Poland, Stanislaw August Poniatowski --- and more importantly to raise funds for those who need it the most. A few years ago, truly sensational information started to circulate among the musicians in London about a discovery at the British Museum – a previously unknown score composed by Prince Joseph M. Poniatowski. Prince Poniatowski was not only a soldier and known politician during the reign of Napoleon III, but also a talented opera singer and composer of Bel Canto operas and a director of Theater Lyrique in Paris. According to experts, the quality of the newly discovered score of the Mass in F was on the level of the most known and loved musical works created by the preeminent Italian composers of the Nineteenth Century. For the first time we are bringing the Mass in F to New York City. 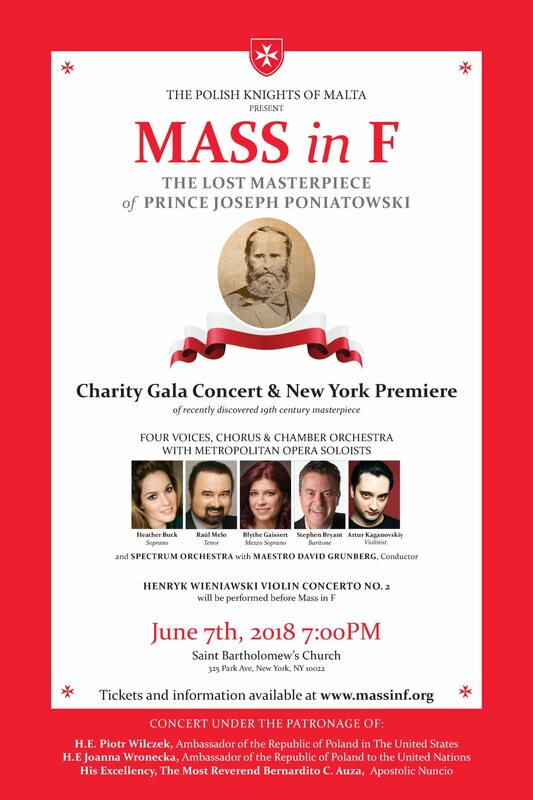 The New York premiere of the Mass in F, will take place at 7:00 PM on Thursday, June 7, 2018, at St. Bart’s Church, 325 Park Avenue in Manhattan. This venue is well known for its unparalleled acoustics, as well as for presenting classical music concerts that include voices from among others, Metropolitan Opera. Before the Mass in F, the beautiful “Concerto Number 2” by Henryk Wieniawski will be performed. David Grunberg – Music Director and Conductor. Choir – assembly of singers of renowned NY area choirs. We are honored that His Excellency Ambassador of the Republic of Poland, Mr. Piotr Wilczek, and Her Excellency Ambassador of the Republic of Poland to the UN, Joanna Wronecka will be in attendance. The VIP reception will be attended by members of the diplomatic corps, clergy, and guests from the world of culture and business. We are grateful that The Most Reverend Bernardito C. Auza, the Apostolic Nuncio and Titular Archbishop of Suacia, Most Reverend Witold Mroziewski, Bishop of Brooklyn and Most Reverend Joseph C. Bambera, Bishop of Scranton will attend the event, among many other VIPs. In the spirit of giving, helping others, caring for others, I’m doing my part, and I’m asking you to do yours by attending the concert if you can, place an adverting in the concert journal or donate to such a great cause. You can be assured that 100% of your donation will be transferred to the beneficiaries. We all work as volunteers also donating our money and time. I am counting on your support and generosity!